It's the third Monday of the month, which means... BLOG HOP TIME with The Stamp Review Crew! I am so happy to finally be playing along again! I had to miss the last few hops as I didn't own the feature stamp set. But I'm back and it's with my favourite stamp set! This week's feature stamp set is "No Bones About It"! I LOVE this set! If you're hopping in then you just came from the talented Shana Gaff's Blog. Just starting? No problem! Start here and follow the buttons, all the away through! 1.) Someone would be insane to do these as party favours. Okay, that doesn't completely rule me out. So instead of calling this a party favour, I'm going to go with a cute, little, party package... Speaking of package, do you recognize what my volcano is made from? If you guessed the Cutie Pie Thinlets, then you would be correct! 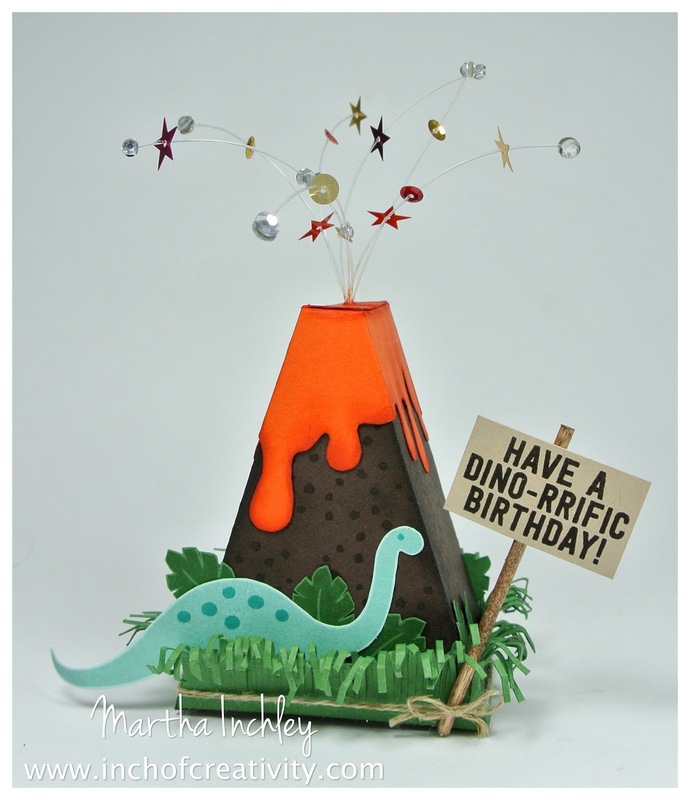 I used the cake thinlit to make the volcano base, but I altered the tip to be flat. I also cut out the "Lava" with the cake thinlit, but just the top portion, I didn't need the whole package again. I drew in the lava drips, cut them out, assembled the sides, slipped it over top, and folded it down to be flat as well. My base is Early Espesso cardstock stamped, and sponged with Early Espresso ink. I used Tangelo Twist cardstock, sponged with Tangerine Tango ink for the lava. My dinosaur is Pool Party cardstock, stamped with Pool Party ink as well as Bermuda Bay ink for his spots. I lined the base of package with Garden Green cardstock - grass and for the leafs, I stamped Garden Green ink onto Garden Green cardstock. So, I couldn't just leave it there... oh no. I wanted my volcano exploding with excitement! So, out came my Rhinestones, my Metallic Sequins, my Brights Sequins, and 25LB fishing line! Remember how I said I slipped the lava over top? Well, luckily I hadn't glued it down yet, so I was able to poke a hole in the top and secure everything inside. Then I added my sequins and rhinestones. The rhinestones were easy, I just stuck one on each side of the fishing line... the sequins... not so much. I used superglue, but it was old and took for EVER to dry, but in the end it's a lock tight hold. Thanks for joining me today and enjoy the rest of the hop! Next up is the talented Dawn Tidd! Wow!! That is incredible! 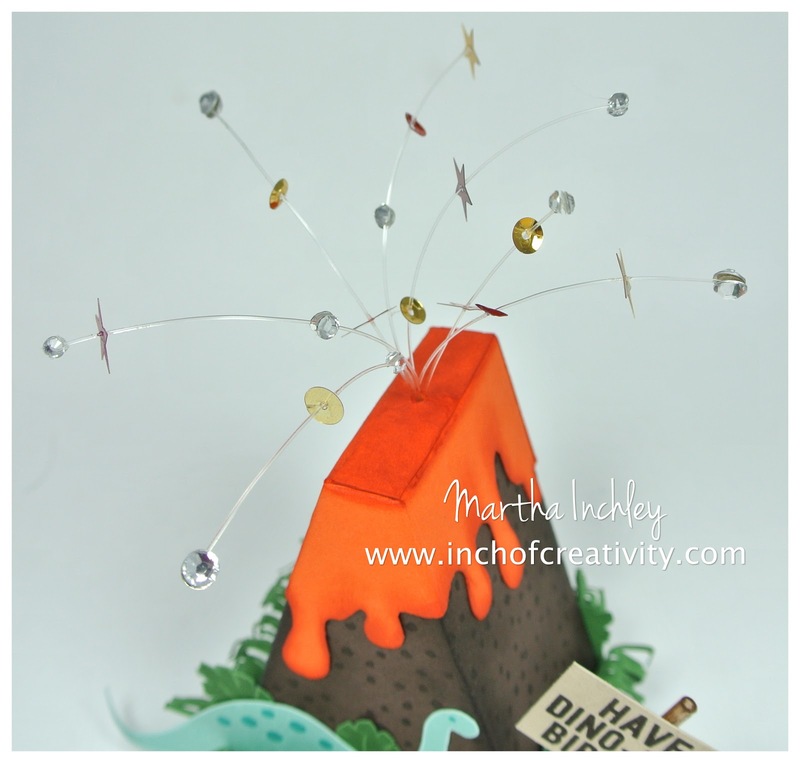 What a spectacular and clever volcano! Amazing isn't a big enough word for this creation! Love it to bits, so perfect for a boys party, go on, you can do it......? Maybe not. Martha - that is amazing. I would use this as a centerpiece. It would certainly steal the show. Great job! This is wonderful! Great project for my grandboys! A table centerpiece is what this looks like to me…where it can be showcased! This is fantastic and so much fun for your boys! GASP! This is unbelievably amazing Martha! I just can't even choose my favourite part because it's all just so good! Thanks so much for sharing! 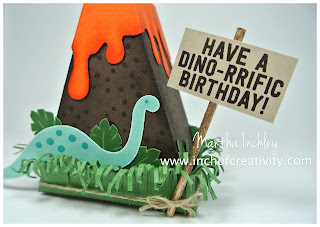 This is the most amazing project I've seen using the cutey pie box die!! Congrats! but later. You are quite a designer!! Keep it up!! Love what you share w/us! This is brilliant! Love it! My two boys would love this too!